Domino’s Dollars = Great Pizza Deals! 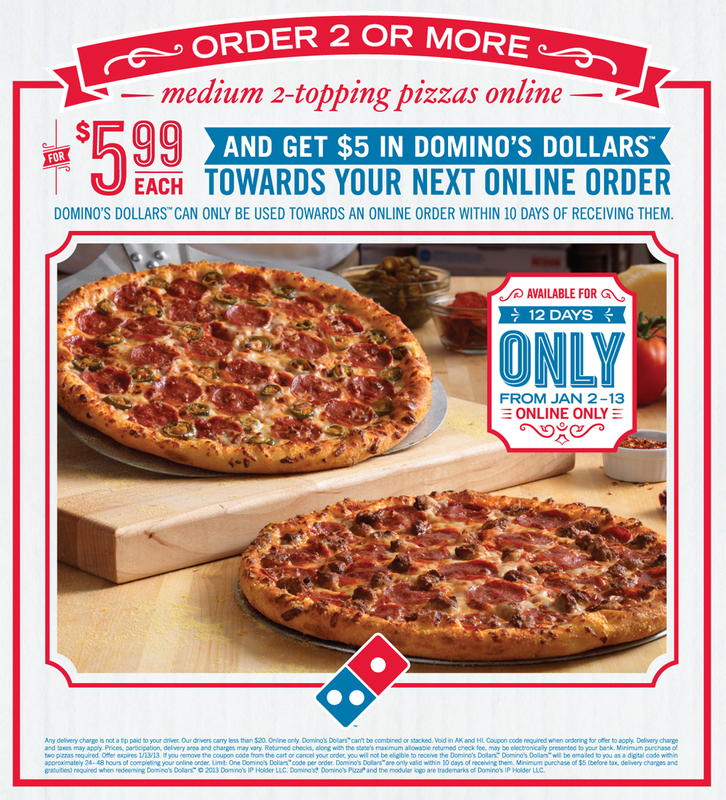 From Jan 2-13, you can order 2 or more medium 2-topping pizzas from Domino's for $5.99 each and you will receive $5 in Domino's Dollars to be used on your next online order! Orders must be placed online in order to take advantage of this deal. Pay just $12 for dinner and get $5 to spend on your next order – nice! Just remember that you need to use the Domino's Dollars within 10 days of receiving them. See this Domino's pizza offer here. This entry was posted in A Uncategorized, Great Offers. Bookmark the permalink. Amazon Price Drop on Huggies Diapers: Great Deal on Size 4’s! TurboTax Deluxe + E-File + State 2012, 33% Off!